The Pre-Purchase Survey (sometimes called a Full Condition Survey) is the most comprehensive type of survey available and we strongly advise you order one when purchasing a used vessel. Because our surveyors are also qualified and highly experienced marine engineers we're prepared to include a free Engine and Systems Survey with a Pre-purchase Survey at no extra cost. We strongly recommend that a Sea Trial is conducted as part of your Pre-Purchase Survey. We believe it's an important part of evaluating a vessel; its engines, its systems, how it handles and its overall performance. When you want to insure a boat, or renew your existing insurance policy, your insurance company will need an Insurance Survey in order to determine the condition and fair market value of the boat. A Valuation Report frequently comes as a standard part of another type of survey; our Pre-Purchase Surveys, Insurance Surveys and Financial Surveys can all include a Valuation Report. Financial Institutions often lend money against the security of a yacht or powerboat and when they do they need independent verification that the vessel is in reasonable enough condition to justify the amount of money being loaned. Click the button below and fill out our enquiry form or call us on: +44 (0) 7545 840 842. We can under take Delivery Inspections for you. 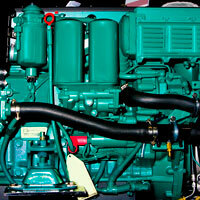 These are carried out prior to accepting the boat from a yard or its dealer. The Delivery Inspection is similar to a Pre-Purchase survey but specifically focuses on how the boat has been finished and whether it has been completed in accordance with the specifications agreed upon at the time it was ordered. We check to see whether modifications agreed upon have been taken care of correctly. We also include a detailed list of items that have to be dealt with before you officially take delivery of your new boat. Arrangements can be made for any mechanical or electrical repairs needed on the vessel to be carried out by our team of highly qualified marine engineers/mechanics. Do contact us to discuss your requirements further. If you instruct us to carry out an oil analysis test on the vessel's engine, it could highlight potential engine and equipment problems before any serious damage is done to the unit. 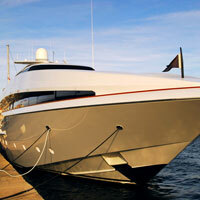 It also provides added security to those purchasing a vessel. We'll take an oil sample on the day of Survey, send it off for analysis and the result will be included in your report. We think this is worth doing as it will highlight the actual wear pattern of the equipment, the condition of the fuel injection equipment, how well the maintenance has been carried out and in a twin-engine set-up we can run a comparison between the two installations. An oil analysis can prevent damage and expensive repairs by isolating any problems and taking early action to fix them. 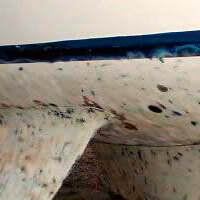 Osmosis is the term used to describe the blistering found on many GRP boat hulls. A GRP boat hull is constructed from polyester resin reinforced with glass fibres that creates a layered laminate. This laminate may have small voids, air pockets and micro-cracks within the resin and at the interface between the resin and the glass fibres. Over time water can pass through the gel coat and laminate where it then disolves the material and creates larger voids that eventually lead to blisters. As more water and moisture is absorbed by the laminate more blisters are formed. Unfortunately it is not a process that can be simply reversed by taking the boat out of the water. When larger blisters develop within the laminate as as well as between the gel coat and laminate these blisters can effect the structural integrity of the hull. Treatment is then necessary. Our Osmosis Inspections are performed by closely inspecting the hull and testing it using a Tramex Moisture Meter. After such inspections, we will gage the extent of the Osmosis, any effect on the structural integrity of the hull and will discuss appropriate courses of remedial action. 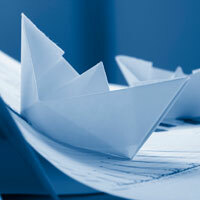 We're passionate about boats and are happy to share our knowledge. If you have limited or no prior boating experience and are considering buying a boat, we can help you decide what type of boat will be best for your requirements. We can discuss with you your plans for your boat, what you require, the appearance, equipment and how you can best utilize it. 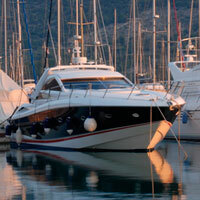 If you're interested we can then help you find the right boat in the right location worldwide. Services provided in the UK, Europe and beyond!